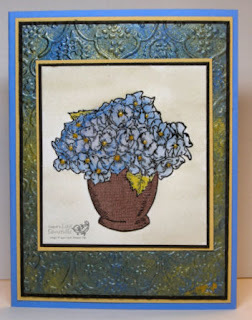 The background piece on this card uses the Artsy Dimension Technique that I wrote for the TJNL...While I had out my dimensional pearls, I decided to use them as my paints for my flower image from Bloomin' Beautiful. To use your dimensional pearls as paints, simply place a drop in a paint well, or on a scrap of paper, dip in your aquapainter, squeeze a tiny bit of water and mix. Use your aquapainter to paint with the pearls. While my pearly paint was still wet, I poured on some clear embossing powder to add some dimension to my flowers. For the vase - I used the Paper Piecing technique and a piece of my Afternoon Tea Designer Series Paper. Hi Lisa ~ I'd like to award you the Arte Y Pico! Just show the award emblem on your side bar and then pick five blogs that you believe deserve this award for their creativity, design, interesting material, and contribution to the blogging community. List the names of the people you chose to receive the award on your blog and link to their blogs. Then let your award winners know by posting a comment on their blog. Each award winner is to show the award and put the name of the person who gave them the award with a link to her/his blog. You also need to show the link to the Arte Y Pico blog to honor the origin of this award. This information is also on my blog for today's post, April 24. WOW how stunning!!!! I love the background and the more I see this set used the more I just HAVE to have it!